This gem, The Kinfolk Table, arrived on my doorstep on Friday. I carried it straight up the stairs, down the long hallway, and into the kitchen where we started cooking from it on the spot. 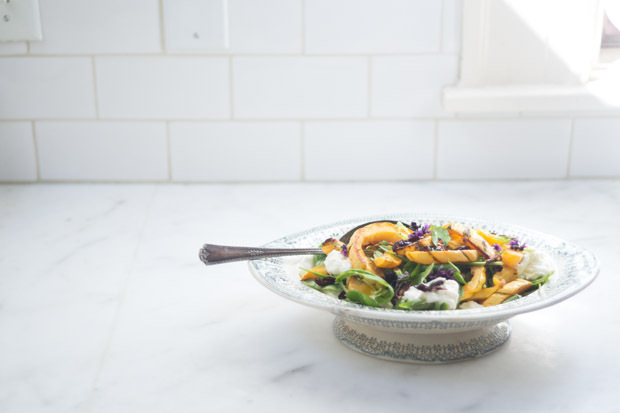 Sam Wylde's Roasted Squash Salad was first, along with Nathan & Katie's Citrus Lentil Salad. 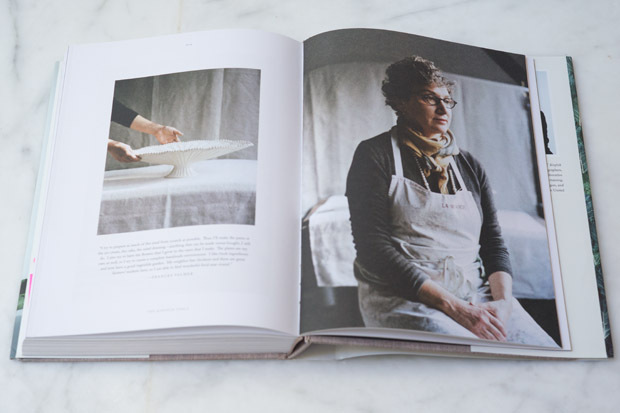 This is a 340+ page book, even more beautiful than expected, celebrating why it can be so good to sit down at a table and share a meal with others. A simple meal. And there is an effortlessness to the cooking throughout, a nice overall vibe, with recipes that are approachable, delicious, often beautiful, but not-at-all fancy or fussy. 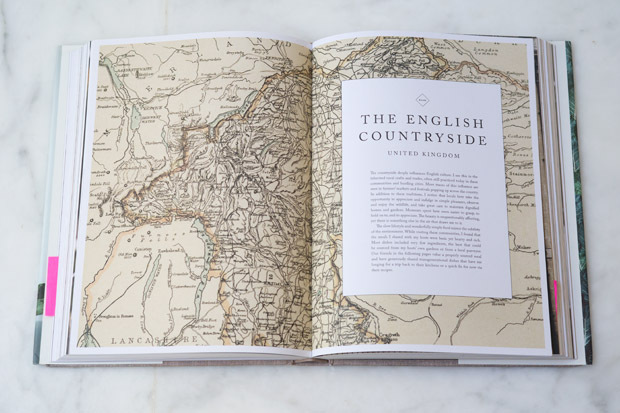 I'm sure many of you will have a chance to page through it in the coming weeks, but in the meantime take a peek at a few of the spreads (photos throughout the book are by Parker Fitzgerald & Leo Patrone, design by Amanda Jane Jones). 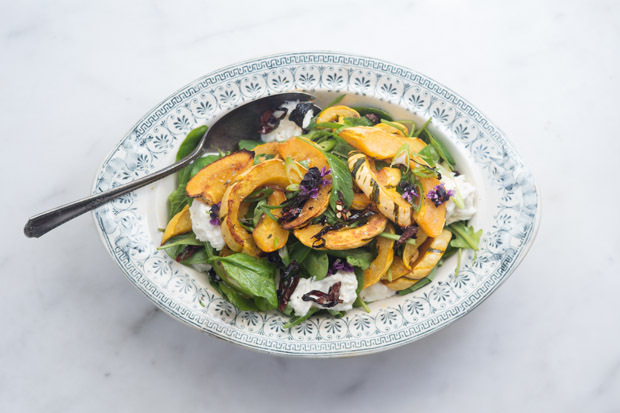 I share the Roasted Squash, Chile, and Mozzarella Salad down below. 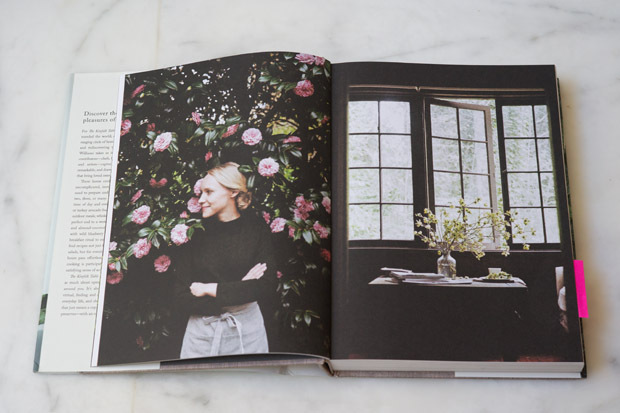 The way the book is organized, you get a glimpse into the homes of a range of home cooks - musicians, writers, editors, florists - and they share recipes and inspiration from their tables. Beautiful preparations from a spectrum of individuals, from a range of places. Your choice of chile is up for grabs here. The recipe was contributed to The Kinfolk Table by restauranteur Sam Wylde who uses 2 teaspoons of Urfa chile flakes for their smoky, tobacco notes. *I used three slivered dried mulato chiles, and loved it. Any smoky dried chile peppers (not too hot/spicy!) should do well here. Preheat the oven to 400F with a rack in the center. Slice the delicata squash into 1/2-inch thick crescents. Toss them in a bowl with the olive oil, garlic, chile, thyme, and salt. Arrange on a baking sheet in a single layer. Roast for 20-30 minutes, or until tender. Flip the squash once along the way to ensure browning on both sides of the squash. Transfer the pan to a rack, allow to cool for a few minutes, and transfer the squash to a serving bowl or platter (I noticed in the book they tossed this salad straight on the baking sheet - brilliant. p.170). To serve, toss the arugula with the squash with a splash of olive oil. Toss until nicely coated, then pull the mozzarella ball apart, and gently toss it with the squash as well. Season with more salt if needed, and finish with some slivered scallions if you like. 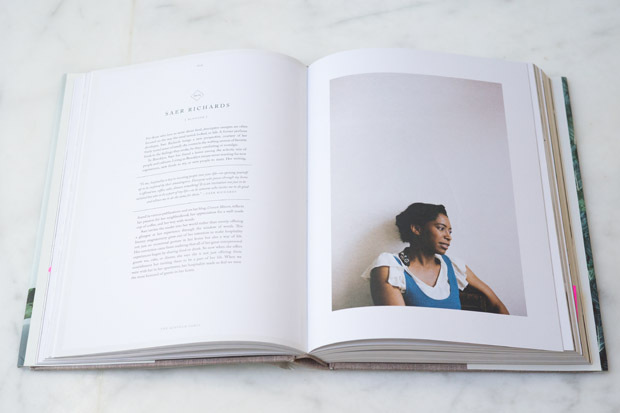 Adapted from The Kinfolk Table by Nathan Williams, published by Artisan October, 2013. Pungent, herby, and assertive, this is an incredibly versatile sauce. From Deborah Madison's new book, Vegetable Literacy, it's made with pounded capers, walnuts, green olives, and a load of herbs - the perfect slather for everything from sandwiches and pasta to egg salad and vegetables.